The Unsealed Crime Scene: Someone trashed the cottage. Who and why? The front door of the cottage is wide open. On December 18 the door is closed and masking tape is on the seal notice. In the area underneath there are numerous traces of blood present. Inside the wardrobe there are clothes on the shelves. No clothes inside the wardrobe. 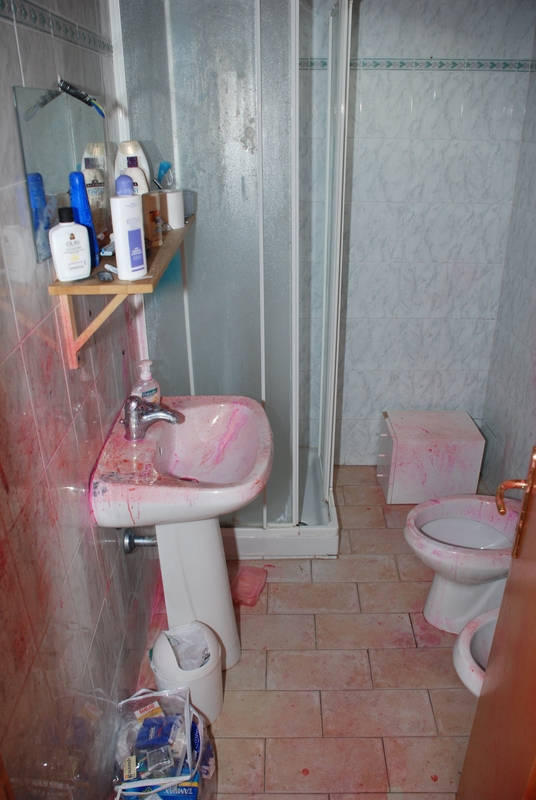 Note the presence of a pillow on which there are numerous blood traces present. The bed: On the mattress there is a towel with a blood stain and an open handbag. The bed is without the mattress. 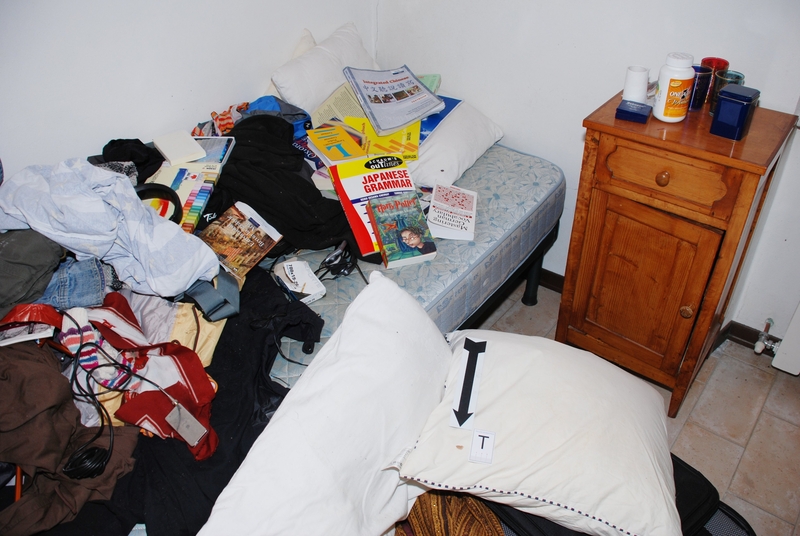 On the wooden supports of the bed there is a pile of clothes (underwear, sweaters, outfits, shirts). The shoes have been removed from the wardrobe and piled up near the bed together with the clothes. Blood traces underneath the desk (2 drops of blood). belonging to the victim’s bra, found and collected during the second site inspection. On the desk the objects present are completely different to those found in the first site inspection. Also beneath the desk the area has been tampered with. Books on the shelf of the desk. 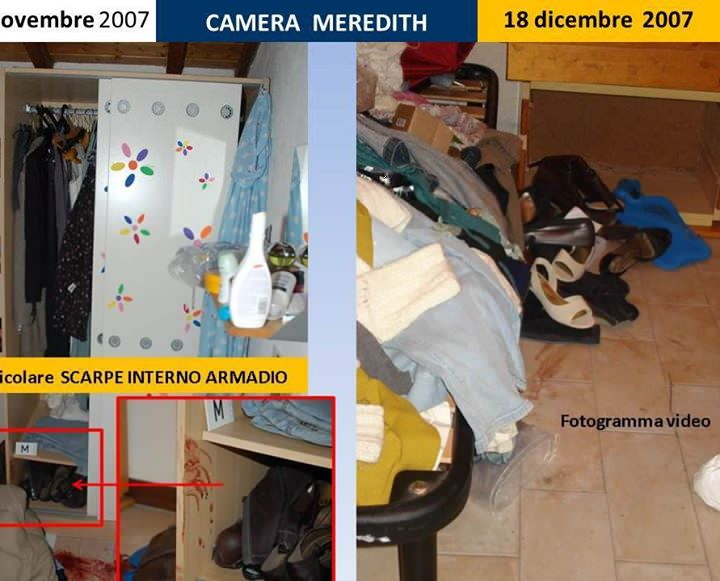 On the desk there is also a rucksack with blood traces which was collected from the floor, next to the victim’s duvet. It is photographed, labeled, but is not collected. It is only collected during the third site inspection (13 March 2008). Here is the famous mat. Here is the desk, with the mat but not on its own, before the discovery of the bra clasp. who knows how it slid under the desk, but we’ll discuss this in a chapter all of itself. Table almost tidy. The bench is in one piece. The bench is broken, the table in clear disorder. There’s even a cushion and, what’s really outrageous, there is a box of disposable latex gloves. Two gloves are out of the box, so already contaminated. Still in the 2nd Site inspection, on the sofa, in the living room, Meredith’s mattress, how did it get there? LOOK, it was all photographed. The mattress together with the mattress cover is DRAGGED along the floor of Meredith’s bedroom to the sofa, into the living room. …and again on Nov 3, 2007. Right: The “same” piece December 18, 2007 when reperted. The hook is further deformed. 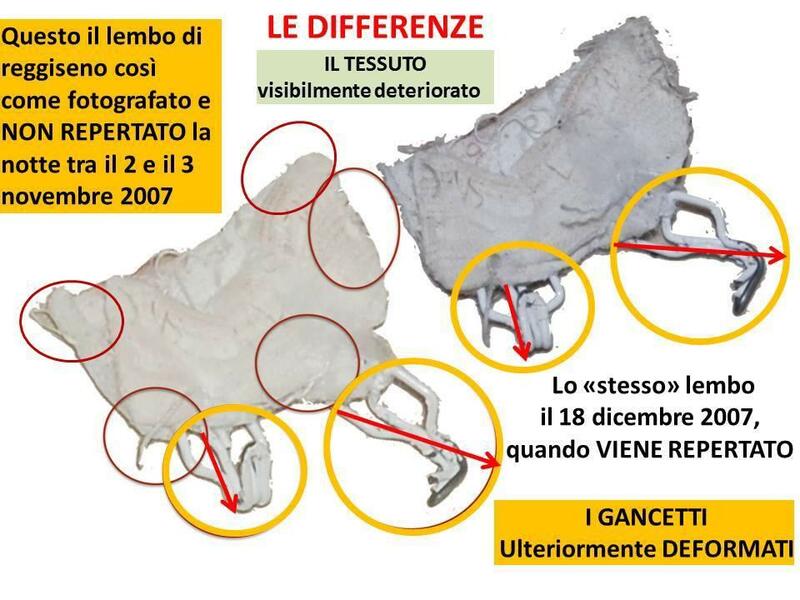 The flap of tissue visibly deteriorated.